These giant, wild Snow crabs are hard to find at fishmongers in Scotland. Fishmongers do not really stock them as I have found BUT you can find cooked wild Canadian Snow Crab Clusters, the premium selection which are 100% natural with no preservatives and are naturally low in fat from Costco. It says exactly that on the box. They are not always available at the frozen section as these delicious Snow crabs are only sold seasonal as of now till maybe Christmas time. 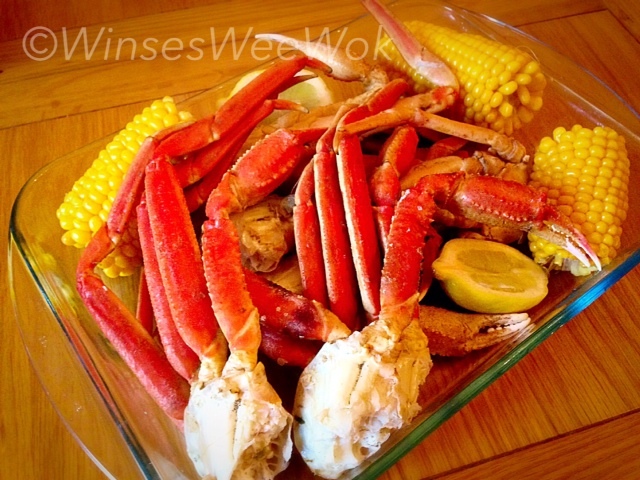 The meat is still sweet after the process of re- heating as the crabs are naturally sweet. The sweet corn cob adds sweetness to the crabs too. The end result is a delicate, soft, sweet and flavoursome platter of Snow crabs! All you have to do is buy a box and re- heat them with 2 ingredients, combine with butter and lemon and hey…it`s ready so Lets tuck in! • Bring 2 ½ litres of boiling to boil in a deep pot. Add sweet corn cobs, ginger and salt into the pot. Keep a lid on and boil on a high temperature for 10 minutes. • Make the dipping sauce by gently melting the butter at a very low heat. Pour into a dipping bowl along with the juice of 1 lemon. Set aside. • Submerge the crabs in water after 10 minutes, lid on and boil for only 5 minutes. Drain onto serving platter plate. Serve!